T Shirts -- One Design Sailboat Covers -- The Sailors Tailor, Inc.
Hanes Heavyweight 50/50 white shirt with blue graphic on the front and Multi-neon-colored boats on back. 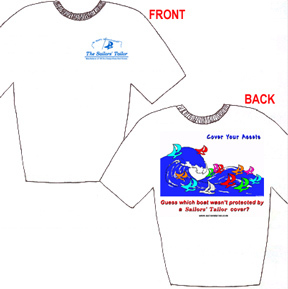 If the total of your cover order totals more than $500.00, (without shipping) we will send you a FREE T-Shirt. When checking out during an on-line order, look for the link "Is your order more than $500.00". Need more shirts for the wife, kids, and your crew. We have them for sale for just $7.00 each. NOTE: If you are buying T-shirts by themselves, please call us to obtain a better rate on shipping. Due to some limitations with our shopping cart, shipping is calculated correctly when shirts are ordered with other items, but over priced when shipped alone.